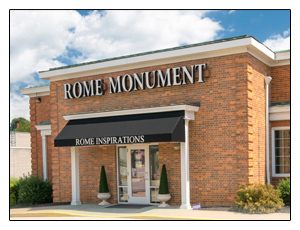 Visit the Rome Monument Showroom and Main Office in Rochester, PA. Call 724-770-0100 to schedule a meeting to discuss a memorial design. Rome Monument is a fourth-generation company creating personalized memorials for families in western Pennsylvania, eastern Ohio and northern West Virginia. The company was founded by Michael Dioguardi, a stone craftsman from Italy who immigrated to Rochester in 1930 and started his own monument firm four years later. The current owners are Vince and Christy Dioguardi and Diane and William Hapach Jr., all of whom work at one of the facilities. We specialize in cemetery, civic and cremation memorials. All carving and lettering is done by certified master carvers in the company’s 30,000-square-foot manufacturing space in Monaca. In 2013, Rome Monument was proud to coordinate the design, placement and engraving of the Tuskegee Airmen Monument located in the Sewickley Cemetery.